QT interval prolongation and a ventricular dysrhythmia occurred in an HIV-positive 30-year-old man at the start of intravenous clarithromycin therapy 500 mg 12-hourly. Intravenous clarithromycin caused thrombophlebitis in four patients when it was given inappropriately as a rapid bolus injection instead of a short infusion; the manufacturers have received other reports of similar reactions, even with infusions, but the incidence seems to be considerably lower than with erythromycin. In a prospective, non-randomized study, phlebitis occurred in 15 of 19 patients treated with intravenous erythromycin (incidence rate of 0.40 episodes/patient-day) and in 19 of 25 patients treated with intravenous clarithromycin (0.35 episodes/patient-day). Bronchospasm with clarithromycin occurred in a 44-year-old woman who had no history of respiratory allergies but had had adverse drug reactions to general and regional anesthetics and to ceftriaxone. After the administration of a quarter of the therapeutic dose the patient had dyspnea, cough, and bronchospasm throughout the lung. Adverse events on the nervous system due to clarithromycin have been observed in 3% of patients. Progressive loss of strength and difficulty in swallowing and eye opening after the first dose of clarithromycin (2 g/day) occurred in a patient with cerebral toxoplasmosis and AIDS. This myasthenic syndrome resolved within 6 hours of withdrawal of clarithromycin and administration of pyridostigmine. The authors postulated that this adverse effect may have been the consequence of neuromuscular blockade, through inhibition of the presynaptic release of acetylcholine. Topical clarithromycin can cause self-resolving corneal deposits. Ototoxicity was attributed to clarithromycin in a 76-year-old man 4 days after he started to take clarithromycin for atypical pulmonary tuberculosis. When the clarithromycin was withdrawn his hearing improved subjectively, but it worsened again on re-exposure. Abnormal taste developed in 17 of 175 patients treated with clarithromycin 250 mg bd for 10 days for community-acquired pneumonia, compared with 3 of 167 patients treated with sparfloxacin. Mild to moderate gastrointestinal disturbances were the most common adverse events and were reported in 13 and 11% respectively. Two patients, a man aged 74 and a woman aged 56 years, developed delirium after taking clarithromycin. Two patients (aged 21 and 33 years) with late-stage AIDS had acute psychoses shortly after taking clarithromycin (2 g/day) for MAC bacteremia. In both cases the psychosis resolved on withdrawal but recurred on rechallenge. In one case treatment with azithromycin was well tolerated. Of cases of mania attributed to antibiotics and reported to the WHO, 28% were due to clarithromycin. A 77-year-old man who was HIV-negative developed mania after 6 days treatment with clarithromycin 1 g/day for a soft tissue infection; his mental state resolved on withdrawal. A 53-year-old Canadian lawyer taking long-term fluox-etine and nitrazepam developed a frank psychosis 1-3 days after starting to take clarithromycin 500 mg/day for a chest infection. His symptoms resolved on withdrawal of all three drugs, and did not recur with erythromycin or when fluoxetine and nitrazepam were restarted in the absence of antibiotics. The symptoms may have been due to a direct effect of clarithromycin or else inhibition of hepatic cytochrome P450 metabolism, leading to fluoxetine toxicity. Clarithromycin occasionally causes hallucinations. Visual hallucinations with marked anxiety and nervousness occurred after the second dose of oral clarithromycin 500 mg in a 32-year-old woman. Clarithromycin was withdrawn and the symptoms disappeared a few hours later. Visual hallucinations developed in a 56-year-old man with chronic renal insufficiency and underlying aluminium intoxication maintained on peritoneal dialysis 24 hours after he started to take clarithromycin 500 mg bd for a chest infection, and resolved completely 3 days after withdrawal. Thrombotic thrombocytopenic purpura was reported in a 42-year-old man with no past medical history after he had just completed a 30-day course of clarithromycin 250 mg bd. Erythromycin acts as a motilin receptor agonist. This mechanism may be at least partly responsible for the gastrointestinal adverse effects of macrolides. Clarithromycin may act on gastrointestinal motility in a similar way. In dogs, clarithromycin caused contractions and discomfort, as did erythromycin. In healthy volunteers, oral clarithromycin 250 mg bd caused a statistically significant increase in the number of postprandial antral contractions and antral motility. A single oral dose of clarithromycin 3000 mg resulted in severe abdominal pain within 1 hour of administration in two patients. Based on observations made in dogs and rabbits, clarithromycin is significantly less potent than azithromycin and erythromycin as an agonist for stimulation of smooth muscle contraction. Therefore, a lower rate of gastrointestinal adverse events would be expected with clarithromycin. Pseudomembranous colitis is relatively rarely seen with macrolides, but has been reported with clarithromycin. Abnormal liver function tests and hepatomegaly have been described with clarithromycin; in 4291 patients, the frequency of increased alanine transaminase activity was 5%. Clarithromycin was also associated with cholestatic hepatitis. To date, at least nine cases of hepa-totoxicity have been described in HIV-negative patients taking clarithromycin 1-2 g/day for chronic lung disease due to M. avium or Mycobacterium abscessus. The pattern of liver enzyme abnormality was primarily cholestatic, and the patients were typically elderly (all but one aged over 60 years), or of low weight. Only three patients were symptomatic, and the liver function abnormalities resolved on withdrawal. Subsequent rechallenge was successful in four patients, unsuccessful in one, and not performed in four. There was some dispute as to whether toxicity was dose-related or not, but it is wise to recommend that elderly patients should receive an initial daily dose of 1 g in this disease setting. Although cholestatic hepatitis has been typically described in association with erythromycin, newer macro-lides are not totally free of this risk. A gradual increase in bilirubin and transaminases has been reported during treatment of a Mycobacterium chelonae infection with clarithromycin. These alterations were quickly reversible after withdrawal, but re-appeared on re-exposure to clarithromycin 1 g.
Fatal drug-induced cholestasis associated with clarithromycin 500 mg bd for 3 days has been reported in a 59-year-old woman with diabetes mellitus and chronic renal insufficiency. Idiosyncratic drug-induced fatal fulminant hepatic failure has been reported in a 40-year-old woman with end-stage renal insufficiency taking clarithromycin 500 mg bd. 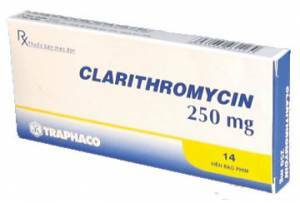 Clarithromycin has been associated with fixed drug eruptions and hypersensitivity reactions. In one case a clarithromycin-induced fixed drug eruption was reproduced by oral provocation, whereas patch tests on both unaffected and residual pigmented skin were negative. A 31-year-old woman developed Stevens-Johnson syndrome after she had taken oral erythromycin 333 mg tds for otitis media. After two doses she developed oral ulcers, tongue swelling, and a generalized erythematous rash. The diagnosis was confirmed histologically. She recovered slowly after withdrawal of erythromycin.